Winter is an energy-intensive time of year at Tikalon's home in the Northeastern United States. The days are shorter, leading to a longer daily interval of artificial lighting. The newer LED lamps have reduced energy cost considerably, but home heating requires a lot of energy. About 250 therms is needed to heat my house during the course of a cold winter month. A therm is about 100 cubic feet of natural gas; and, depending on location, a therm costs slightly more, or less, than a dollar. There's also considerable expenditure of human energy involved in snow removal. Fortunately, I have a powerful snow blower. This nine horsepower blower allows the clearing of my driveway, and the driveways of two neighbors, in just an hour after a typical eight inch snowfall. The traditional conversion factor for a horsepower is 746 watts, so a nine horsepower engine is equivalent to more than six kilowatts! When my home boiler and snowblower are operating simultaneously, I'm a major contributor to greenhouse gas emission. I'm an advocate of renewable energy, having written quite a few articles on this topic over the years. While hydroelectric and tidal power plants are renewable energy sources with fairly constant output, the supply of energy from other renewable energy sources is sporadic. You can't get that much solar energy on cloudy days, and there's none at night. Wind turbines are capable of supplying power at night, but only when the wind blows. You need to store energy so it will be available for later use. While batteries are used in some energy storage applications, their low energy density precludes their use when large quantities of energy must be stored. Gasoline has an energy density of 46.9 kilojoules per gram, but a lithium battery will store just 2.5 kilojoules per gram. There's a proposal for distributed battery storage of electricity using electric vehicle batteries, but an improved battery technology must be developed before batteries are an economical component for dedicated electrical grid energy storage. Flow batteries might be that technology, but the energy density of presently developed aqueous flow batteries is lower than that of lithium batteries with ​LiFePO4 cathodes (about 225 watt-hour/liter). Batteries store energy by chemical reaction. In the case of a lead-acid battery, it's through the reversible transformation of the lead electrodes to lead sulfate. There are some electrochemical reactions, however, that involve only electrolyte solutions, so the electrode materials are not changed. 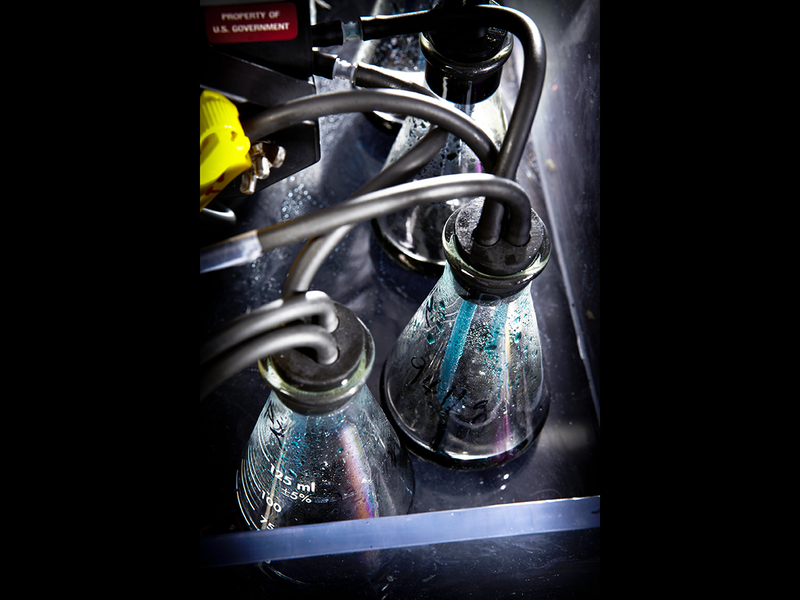 A flow battery operates by removing the charged electrolytes from such batteries, storing them in tanks, then replacing them when battery discharge is required. The reaction potential at the cathode with respect to a standard hydrogen electrode is 0.5360 volts, and the potential at the anode is -0.7626 volts, giving this battery a cell voltage of 1.2986 volts. A schematic diagram of this flow battery appears below, along with a photo of the laboratory demonstration apparatus for a related vanadium-redox flow battery. Flow battery construction is easy, as this laboratory demonstration of a related vanadium-redox flow battery shows. Note the safe laboratory practice of placing the flasks in a polyethylene tray to mitigate spills. The electrolyte of the zinc-polyiodide flow battery developed by the Pacific Northwest National Laboratory has an energy density more than two times that of the next-best flow battery and 70% that of a lithium iron phosphate battery. Says Wei Wang, an author of the study and a materials scientist at PNNL, "Another, unexpected bonus of this electrolyte's high energy density is it could potentially expand the use of flow batteries into mobile applications such as powering trains and cars." The PNNL team has demonstrated a discharge energy density of 167 watt-hour/liter for a nearly neutral pH 5.0 M ​ZnI2 electrolyte. In theory, a more highly concentrated electrolyte could discharge up to 322 watt-hour/liter. Electric cars use about 350 watt-hours for each mile of city driving. The following graph shows the cycling performance of the zinc-iodine flow battery using Nafion 115 as the membrane, a 3.5 M ​ZnI2 electrolyte, and a current density of 10 mA/cm2. Cycling performance of the zinc-iodine flow battery. Zinc dendrites are a problem, since they can puncture the membrane, so the PNNL team is trying other alcohols and additives to see whether the dendrites can be eliminated, and the team is scaling-up to a 100-watt-hour system. This research was funded by the US Department of Energy. Mark Chediak, "Musk Battery Works Fill Utilities With Fear and Promise," Bloomberg, December 4, 2014. Bin Li, Zimin Nie, M. Vijayakumar, Guosheng Li, Jun Liu, Vincent Sprenkle, and Wei Wang	, "Ambipolar zinc-polyiodide electrolyte for a high-energy density aqueous redox flow battery," Nature Communications, vol. 6, article no. 6303 (February 24, 2015), doi:10.1038/ncomms7303. This is an open access article, with a PDF file available, here. Supplementary information for ref. 2 (850 kb PDF file). Frances White, "New flow battery to keep big cities lit, green & safe," Pacific Northwest National Laboratory press release, February 25, 2015. How Flow Batteries Work, Pacific Northwest National Laboratory YouTube video, February 25, 2015. Linked Keywords: Winter; energy; year; Tikalon; Northeastern United States; day; artificial lighting; LED lamp; cost; central heating; home heating; therm; month; cubic foot; cubic feet; natural gas; dollar; human; snow removal; snow blower; horsepower; driveway; neighbor; hour; inch; snowfall; conversion factor; watt; boiler; greenhouse gas emission; renewable energy; hydroelectricity; hydroelectric; tidal power; renewable energy sources; solar energy; cloud; cloudy; night; wind turbine; electric power; wind; flywheel energy storage; wind-up toys; potential energy storage; flow batteries; flow energy storage; compressed air energy storage; electrical grid; battery; energy density; gasoline; joule; kilojoule; gram; lithium battery; electricity; electric vehicle; technology; economics; economical; electrical grid; aqueous solution; lithium iron phosphate battery; ​LiFePO4; watt-hour; liter; chemical reaction; lead-acid battery; reversible process; chemical transformation; lead; electrode; lead sulfate; electrochemistry; electrochemical; electrolyte solution; electric charge; charged; discharge; scientist; Pacific Northwest National Laboratory; scientific literature; publish; research; zinc; iodine; material; half reaction; chemical reaction; electrode potential; cathode; standard hydrogen electrode; volt; anode; electrochemical cell; schematic diagram; laboratory; apparatus; vanadium redox battery; Creative Commons Attribution 4.0 International License; polyethylene; neutral pH; cation; anion; polyiodide; ion exchange; selective membrane; electroplating; electroplate; metal; metallic; energy density; Wei Wang; author; materials science; materials scientist; train; automobile; car; theory; concentration; concentrated; electric car; mile; city; driving; Cartesian coordinate system; graph; charge cycle; cycling; Nafion; current density; ampere; mA; square meter; cm2; flammability; fire-safe; acid; acidic; hazard; temperature; dendrite; ethanol; Celsius; °C; alcohol; US Department of Energy.